Click here to purchase tickets for the 2018 dinner. If you would like to make a donation, but cannot attend, please click here. During the Holocaust there were thousands of non-Jews who refused to be passive in the face of the evil they witnessed, rescuing Jews at risk to their own lives and often to the lives of their families. In 1986, Rabbi Harold M. Schulweis created The Jewish Foundation for the Righteous (JFR) to fulfill the traditional Jewish commitment to hakarat hatov, the searching out and recognition of goodness. The JFR provides critical financial support to aged and needy Righteous Gentiles offering a degree of dignity to their lives that would not otherwise be available. The Foundation provides monthly financial support to more than 300 aged and needy non-Jewish rescuers in twenty countries and educates future generations about their extraordinary acts of courage. Rescuers serve as role models for us and for future generations. They teach us that, even in the midst of the worst evil in recorded history, each human being had the capacity to act humanely. Without their example, we are left only with the lessons of atrocity, hatred, and indifference to teach our children. Since its founding, the JFR has provided more than $40 million to rescuers – helping to repay a debt of gratitude on behalf of the Jewish people to these noble men and women. The JFR’s Holocaust teacher education program has become a standard for teaching the history of the Holocaust and educating teachers and students about the significance of the Righteous as moral and ethical exemplars. December 1944 – The Ardennes, The Battle of the Bulge – The 106th Infantry Division landed in France some ninety days after D-Day. The division, which consisted of the 422nd, 423rd, and 424th Regiments, began an arduous journey by truck across France and Belgium. The winter of 1944 was brutal – it was cold and wet. The 106th Division reached the Schnee Eifel area in eastern Belgium near the German border by December 10, 1944, and took up their positions, with the 422nd Regiment taking up a forward position. On December 16, 1944, the 422nd was attacked by the Germans as part of their counter offensive, which became known as the Battle of the Bulge. The Regiment was quickly cut off and surrounded. In the afternoon of December 19, 1944, Colonel Deacheneaux, Commander of the 422nd Regiment, decided to surrender. Parts of the Regiment, including Headquarters Company, in which Master Sgt. 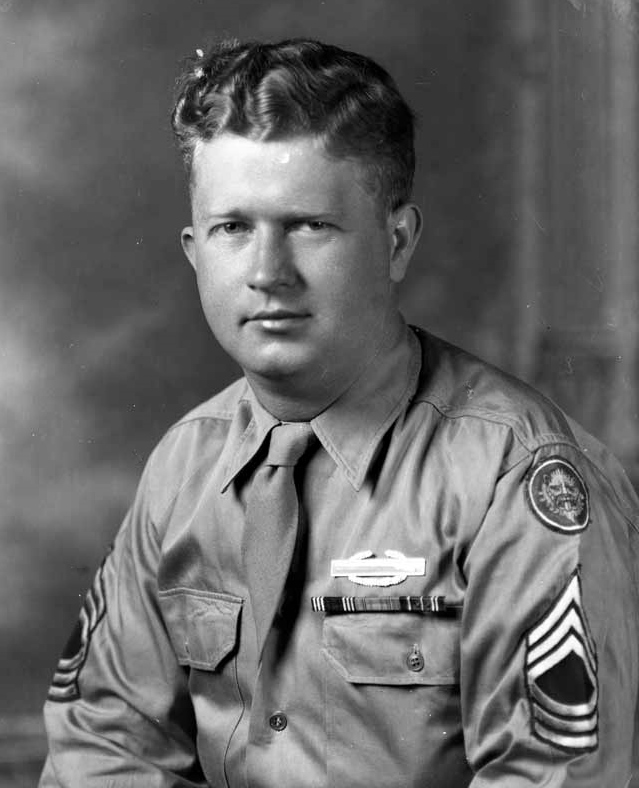 Roddie Edmonds served, held out until December 21, 1944, when they surrendered to the Germans. The Germans captured more than 20,000 GIs during the Battle of the Bulge. The men of the 422nd Regiment were marched some fifty kilometers to Gerolstein, Germany where they were loaded into box cars, 60 to 70 men per car, with virtually no food or water. They spent seven days and nights traveling to Stalag IXB in Bad Orb, Germany. After several weeks in Bad Orb, the American POWs were divided into three groups – officers, non-commissioned officers (NCOs), and enlisted men. The NCOs were taken to Stalag IXA in Ziegenhain. There were 1,000 men in this group. The highest ranking NCO was Master Sgt. Roddie Edmonds from Knoxville, Tennessee. Upon their arrival in Ziegenhain, the commandant of Stalag IXA, Major Siegmann, ordered all Jewish POWs to present themselves the next morning. Master Sgt. Edmonds ordered all 1,000 American POWs to stand in formation outside of their barracks. The next day, when Major Siegmann saw that all 1,000 GIs were standing in front of their barracks, he turned to Edmonds and demanded: “They cannot all be Jews!” To this, Master Sgt. Edmonds said, “We are all Jews.” Siegmann immediately drew his pistol and aimed it at Edmonds. Roddie Edmonds did not back down and replied: “According to the Geneva Convention, we only have to give our name, rank and serial number. If you shoot me, you will have to shoot all of us, and after the war you will be tried for war crimes.” Siegmann turned around and left. There were 200 Jewish GIs among the 1,000 American POWs. This act by Master Sgt. Edmonds saved the lives of 200 Jewish GIs. Master Sgt. Roddie Edmonds died in 1985. In 2018, the JFR made a documentary about Master Sgt. 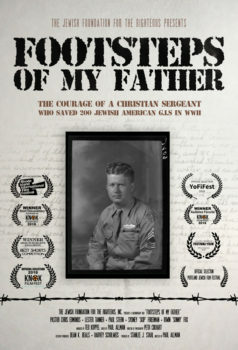 Roddie Edmonds, Footsteps of My Father. The documentary has been shown at film festivals across the United States, has received awards, and has been submitted for consideration by the Academy Awards in the short documentary category.